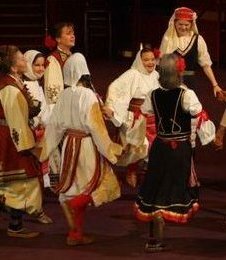 Dances from Spain, Greece, Poland, France and Switzerland (See our photos). Tackling dances from Spain was no small feat; luckily the dances from Italy and Portugal were less demanding. (See our photos). We had a 'multi-national' year and demonstrated dances in a mix of costumes from all over Europe. (See our photos). A couple of performances of dances from Poland, Hungary and Israel, in Polish and Hungarian costumes. (See our photos). There were only a few performances this year - and those were Turkish dances or dances of other ethnic groups from the Anatolian region, . (See our photos). We concentrated on Greek dances as we had temporary use of costumes from The Society for International Folk Dancing. The new, mostly very young display team ventured out and took part in events around the area (several Diamond Jubilee and other village fetes). (See our photos). In 2012, several of the dancers who had grown-up in the group moved on (a couple to the new Anatolian group). The new, mostly very young display team ventured out and took part in events around the area (several Diamond Jubilee and other village fetes). (See our photos). In 2011, we took part in the Chichester Mayfest, Hotham Park Heritage Fair and enjoyed dancing out at those and other events with a more heterogeneous image than in previous years. As a 'first' we wore a mix of costumes from many different countries instead of all dressing in the same costume of just one country. We finished the year with a Christmas performance in English costumes. (See our photos). We performed at the Royal Albert Hall in September, where, along with other members from around the country, we represented the Society for International Folk Dancing with a medley of Russian and Armenian dances. This involved several trips to Solihull (outside Birmingham) for practices. We also danced at the Point Theatre in Eastleigh, the Chichester Mayfest, a Women's Institute day of dance and culture, and local fetes (See our photos). This year we were in English costume since we had entered the Llangollen International Musical Eisteddfod in July (See our photos) where we had to present dances from our country. Our first outing was to the Chichester Mayfest, then Llangollen and we also appeared at a number of fetes in August. Several events were cancelled because of wet weather, but the trip to the Embankment was blessed by sunshine; the group performed dances from several countries with particular emphasis on Turkish dances. (See our photos). Two displays were at nursing homes, the first for a summer fair, and, the second, another Christmas performance. 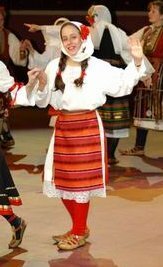 Children and adults gave International folk dance displays in a variety of different national costumes. (See our photos) They performed in a local church festival, a local fete, the Embankment Gardens Theatre and Butlins. They also gave a Christmas performance for the residents of a local nursing home. Twelve adults joined the children to give a Maypole display. The adults wore Edwardian style clothes and the girls had pinafores over full skirts. (See our photos) The children showed closed plaits and barber's pole variations; the adults displayed open plaits like Gypsy Tent and Spider's Web. Unfortunately the weather made things very muddy on one occasion, all in a summer's day! The children also travelled to London to join other SIFD groups at the Embankment Gardens where they performed their favourite English dances, Jenny Pluck Pears and the Hop Picker's Feast. The display team consisted of the Bognor Regis children dressed in Serbian Vlaski costumes (See our photos). The display team performed at the Hunston Church Fete, the Felpham & Middleton English Country Dance Club annual party, the Sands of Time Festival, the Hawth Theatre Crawley and, as part of the Society of International Folk Dancing display, at the Royal Albert Hall. The display team consisted of the Bognor Regis adults and children plus children from Paulsgrove. The adults were dressed in Ukrainian costume, the children in Danish and 'pan-european' costumes. (See our photos) The display team performed the following international folk dances at the Paulsgrove Carnival, the Rustington Carnival and the Pagham Fete: Archangelski Chorowod, Moy Muzhenka, Vosle Sadu & Walenki from Russia, Erva Cidera from Portugal, the Cumberland Reel from Britain and Familie Sekstur & Trommelvals from Denmark. Janet Douglas was invited to train up two Maypole teams for West Meads Jubilee celebrations. One team was made up of children under 12 and the other made up of grandmothers and great-grandmothers. Great fun was had by all. As a result it was decided to form a proper display team and B.R.I.D.E. was born!